PIKETON--Applications are available for the 2018 Fluor-BWXT Portsmouth Science, Technology, Engineering, Math (S.T.E.M.) Scholarship. The scholarship is open to all 2018 graduating seniors attending a high school within the counties of Jackson, Pike, Ross and Scioto counties. 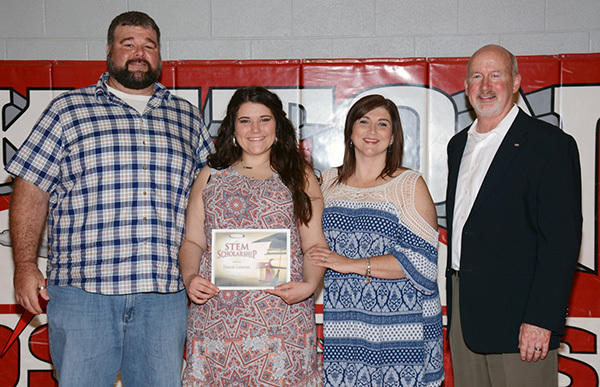 Hannah Lamerson, of Piketon, was one of last year’s Fluor-BWXT S.T.E.M. scholarship recipients. From left, father Tom Lamerson (BWXT), Lamerson, mother Regina Wooten and Fluor-BWXT Portsmouth’s Jeff Wagner. Interested students may contact their local high school counselors or Deneen Revel (deneen.revel@ports.pppo.gov) to obtain an application. The following information, which is detailed on the application, should be provided no later than Friday, March 9: completed application; transcript (with social security number blacked out), recommendation letters and essay. Information can be emailed to Deneen.revel@ports.pppo.gov or postal mailed to Deneen Revel, Fluor-BWXT Portsmouth LLC, PO Box 548, Piketon, OH 45661. If mailing the information, remove all staples. Please call (740) 897-2609 if you have any questions. 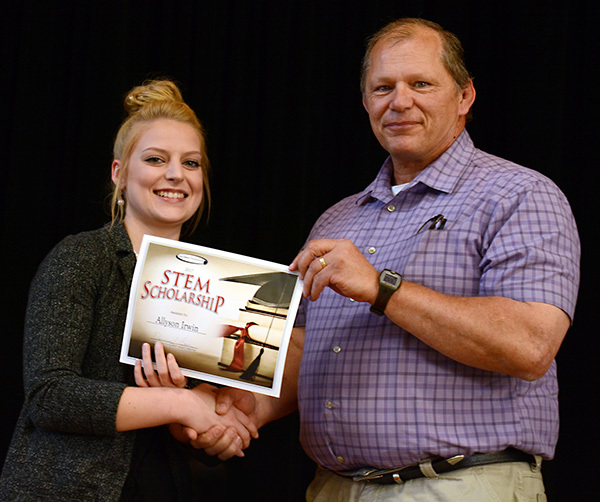 Jackson High School’s Allyson Irwin received the Fluor-BWXT S.T.E.M. scholarship in 2017. From left, Irwin and Fluor-BWXT Portsmouth’s Mike Winningham.